Wild yam is a climbing vine that is native to North America and some parts of Central America and Asia. Also known as Yuma, African nyami, Chinese yam, rheumatism root and devil’s bones, the tuberous roots of wild yam have a long history of use in China and Mexico. Because the plant contains diosgenin, it is traditionally formulated into tinctures, extracts and topical creams. It should be noted, however, that although this chemical is readily made into steroid hormones in the laboratory, this conversion does not take place in the human body. Dioscorea composita, or wild yam, is a member of the Dioscoreaceae family. Wild yam is a twining vine, meaning it supports itself by wrapping around trees or sturdy plants since it can not stand on its own. Its characteristic branched	rhizomes are woody, knotted, elongated, and curved. They have thin, reddish-brown colored stems that can reach lengths of up to 12 meters. Wild yams do not have the large and soft, fleshy tubers of the sweet potato nor the types of yams that are used primarily for food. Instead the wild yam produces very dry and narrow rhizomes. These are twisted and knotty and they bear horizontal branches of long creeping runners. 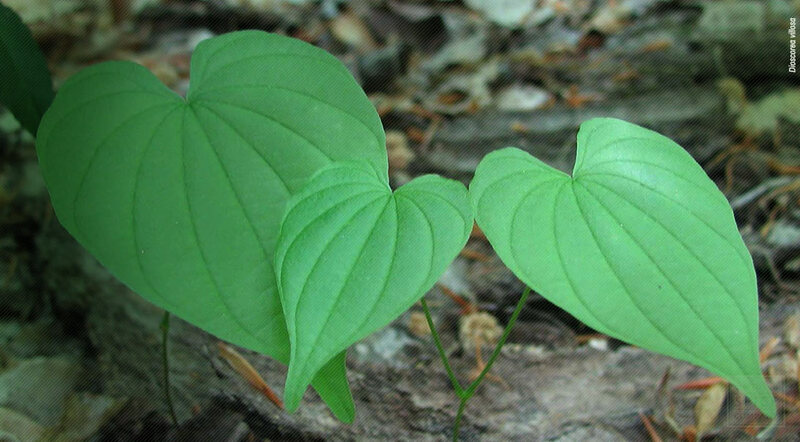 Wild yam's broad heart-shaped leaves are large and flat; the plant's yellowish-white flowers are small and vanilla-scented. The upper side of the leaves is smooth and the underside is downy. Tiny tubercles grow where the leaves branch from the plant. The plant's early-summer-blooming flowers are dioecious and are followed by small greenish fruits. These will turn brown and remain clinging to the vine during the winter. Dioscorea villosa is a member of the Dioscoreaceae family. It is a is a deciduous perennial herbaceous twining plant that grows (in a clockwise direction) over small shrubs. The upper leaves are alternate, heart-shaped and shiny with long petioles, entire margins, prominent veins and acuminated apices. The lower leaves are usually in whorls. The plants are dioecious. Small staminate (male) flowers are white and fragrant, and are in panicles, while carpelate (female) plants have small single flowers at the leaf nodes. The fruit is a membraneous 3-valved capsule with one or two brown winged seeds in each locule. The long, rhizomes are cylinder-shaped and grow to 5-10 mm in diameter, with many tough, slender roots underneath. Named after the Greek physician Dioscorides. Wild yam can be found growing in sunny woodland garden edges, thickets, swamps, and cultivated beds in warm temperate to tropical climates. Grows well in a fertile well-drained soil. Prefers a rich light soil. Divide plants in the dormant season, never when in growth. The plant will often produce a number of shoots, the top 5 - 10 cm of the root below each shoot can be potted up to form a new plant. Baby tubers (tubercles) are formed in the leaf axils. Harvest these in late summer and in the early autumn when the tubercles are about the size of a pea and come away easily from the plant. Pot up immediately in individual pots in a greenhouse or cold frame. Plant out in early summer when in active growth. Can also propagate by seed. Store the dried wild yam root pieces or dried wild yam root powder in an airtight container in a cool, dry place. The root should not be stored for longer than 1 year. The Dioscorea composita yam species is native to Mexico. While the Dioscorea villosa yam species is native to eastern North America, New England to Minnesota, south to Virginia and Texas.